There are several other tropical disturbances in the Atlantic other than Hurricane Florence, including Tropical Storm Joyce and Tropical Storm Helene. 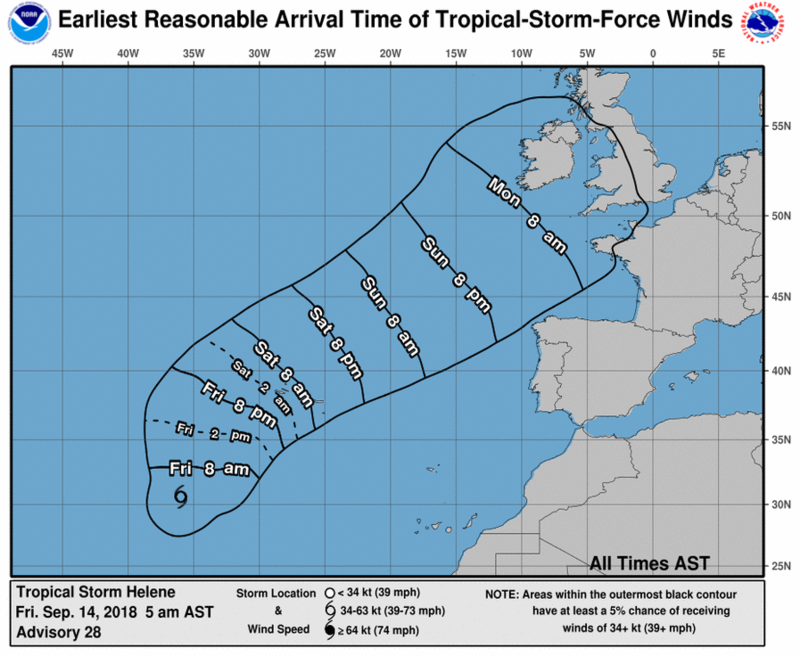 Helene, once a hurricane, is maintaining tropical storm strength and is slated to bring heavy winds and rains to the Azores islands over the weekend. A tropical storm warning was issued for all of the Azores Islands, according to the U.S. National Hurricane Center (NHC). The storm has maximum sustained winds of 70 mph, and it is moving 23 mph to the north. “A turn toward the north-northeast is forecast Saturday followed by a turn toward the northeast by Sunday night. On the forecast track, Helene will pass near or over the Azores late Saturday or Sunday. Satellite data indicate that maximum sustained winds have increased to near 70 mph (110 km/h) with higher gusts. Little change in strength is forecast during the next 24 hours. Afterward, gradual weakening is expected over the weekend as Helene makes the transition to a post-tropical extratropical cyclone,” the NHC said in an 11 a.m. update on Sept. 14. Tropical Storm Joyce, also in the North Atlantic, is moving to the south and is slated to turn eastward by the night of Sept. 14. “Joyce is forecast to slow its forward motion and turn eastward by tonight, and then accelerate northeastward over the weekend. Maximum sustained winds are near 40 mph (65 km/h) with higher gusts. Little change in strength is forecast through Saturday. Joyce is then forecast to weaken to a depression Saturday night or Sunday,” according to the NHC. Isaac, once a tropical storm, weakened to a tropical depression. It is moving west about 300 miles southeast of the Dominican Republic in the Caribbean. There are no warnings in effect for the storm. “A turn to the west-northwest is possible early next week if Isaac survives. On the forecast track, Isaac will move over the eastern and central Caribbean Sea during the next few days. Maximum sustained winds are near 35 mph (55 km/h) with higher gusts. Isaac is forecast to gradually weaken over the next few days, and could degenerate into a tropical wave at any time. A NOAA Hurricane Hunter aircraft is currently en route to investigate the depression,” said the agency. Florence, meanwhile, is moving slowly to the west over the Carolinas and is a Category 1 storm, the NHC said in its latest update. The storm is 20 miles southwest of Wilmington, North Carolina, and 55 east-northeast of Myrtle Beach, South Carolina.